We use the best products to make our flour. We care about the ingredients we use to make our flour. As an example our Besan (Chickpea) flour is made from pure chickpeas. Our competitors use split chickpeas. You can clearly see the difference and more importantly you can taste the difference. It's easy to see why Sartaj is better. The image on the left shows the kind of Chickpeas that we use to make our Besan Flour. Other brands use Split Chickpeas for their Besan. 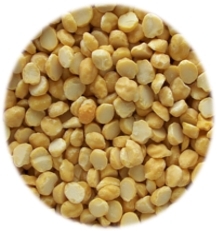 Split Chickpeas contains parts of other material such as peas, other pulses and skin of chickpeas. During a recent trip to the grocery store we found 4lb bags of Chickpeas for $4.99. We also found 4lb bags of Besan (Chickpea flour) for $4.99. 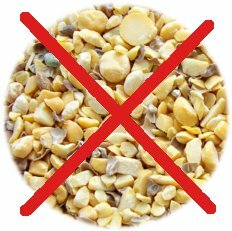 The fact that there is an extra step required to make the Besan from the Chickpeas means the cost should be higher, but it is not because of the inferior (cheaper) raw ingredients in their flour.